I want to give you a recommendation. Although I’m sure no one has been able to miss the recently opened restaurant Vinkkeli based on Pieni Roobertinkatu. We made a dinner reservation there as soon as it opened its doors and I couldn’t have been more pleased. First of all, I love the restaurant itself. The space has a very intimate yet luxurious feel. I find it important to feel relaxed while experiencing fine dining. Stiffness makes me uncomfortable and awkward, therefore I can’t fully enjoy the experience to its full potential. Secondly, the food met all my expectations. Incomplex and straight forward. No complicated or pretentious tastes, yet the menu was well thought through and every detail considered. I was so happy to bump into one of the owners while taking out the trash yesterday. He kindly let us take some pictures inside the restaurant, even though they had already closed for the day. So happy about how these pictures turned out. Janita really managed to catch the mood of a rainy afternoon in one of my favorite restaurants, filled with only traces after joyful meals and get-togethers. To be honest, I’ve never been too interested or into tastes and sophisticated foods. I prefer to eat with a spoon and I love to eat fast so I can go on with my day. Nevertheless I’ve come to appriciate the situation, time, harmony and preparation around a nice meal. I love a beautifully decorated table and the sound of cutlery against the china. I want my food to be simple and the ingredients fresh and tasty. I want to be able to taste every ingredient in every mouthful. Not being able to tell exactly what I’m eating feels weird to me. That’s why I don’t like burgers, sauces and sandwitches with “hidden” ingredients, unless I make them myself. This dessert is so simple and easy. It’s perfect as a sweet end to a summer meal and tastes divine. 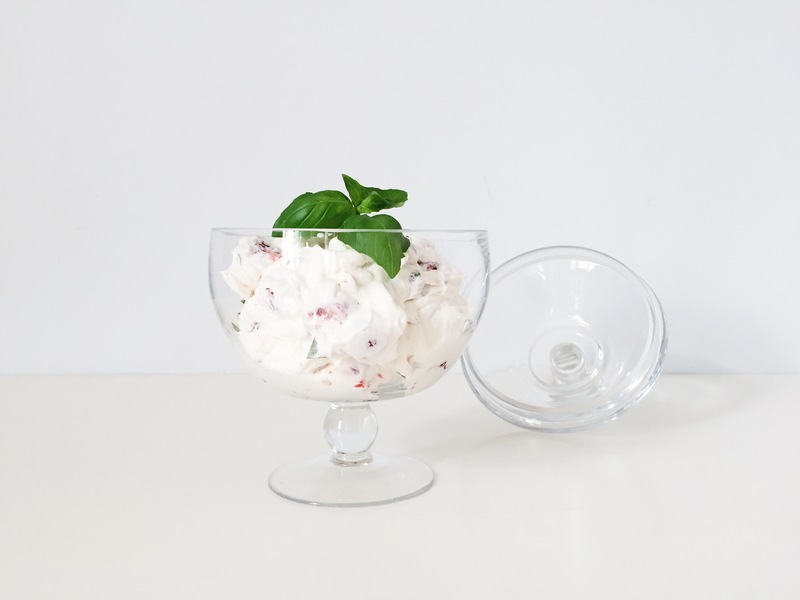 The basil brings it a surprising twist that makes it interesting. 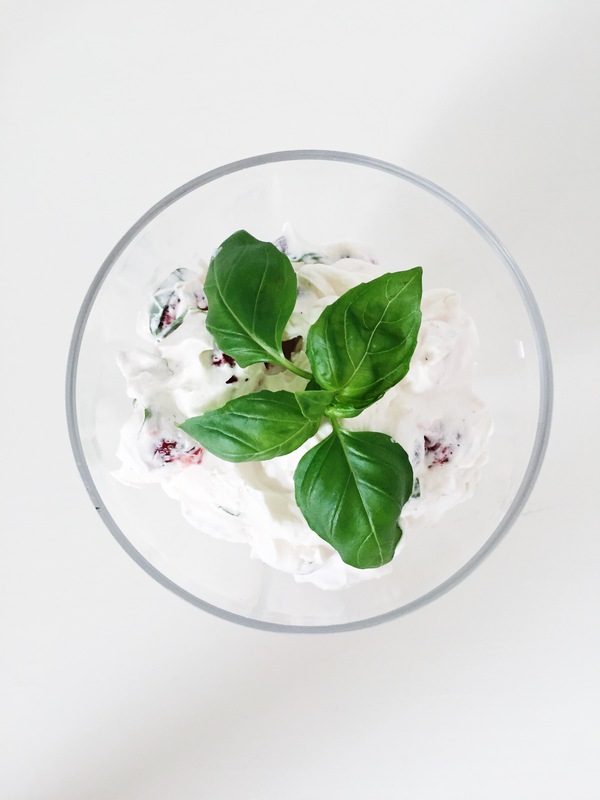 All you need is fresh strawberries, whipped cream with a touch of sugar/vanilla sugar and fresh basil. Blend everything togeather and enjoy!